Endy is a bed-in-a-box mattress that quickly became popular in Canada, then expanded to the US. The company appears to be leveraging the initial success in Canada to the US. The mattress has a foam comfort layer, a very cool cover, and (in my opinion) is a bit softer than average. For that reason, I think it could be a good choice for side sleepers but perhaps not the best fit for people who sleep only on their back or stomach. Its price point makes it a very affordable option for more people as well. Overall I really liked Endy and think a lot of people will too. 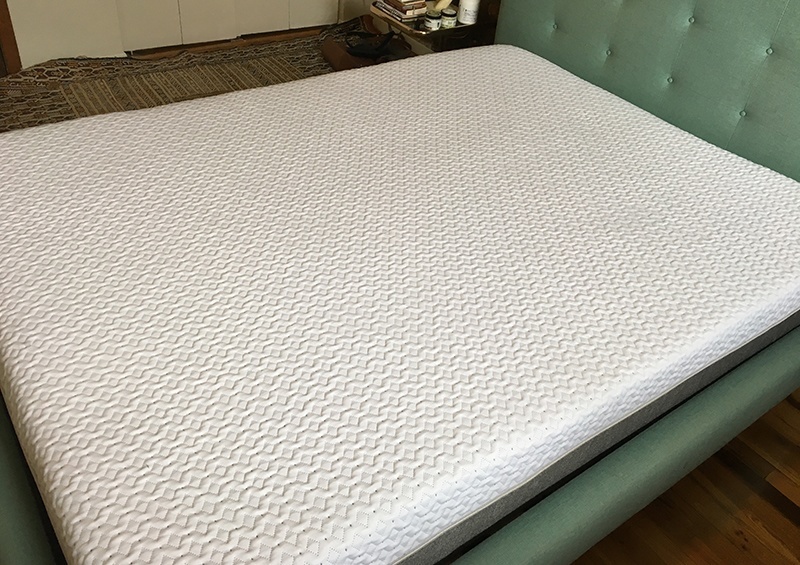 Read about my experience in my full Endy mattress review. Endy is a very comfortable mattress that a lot of people are going to like. You can get $50 off an Endy mattress by clicking the link below and using code CLARITY50 at checkout. Endy has a great feel, more plush than most mattresses of this thickness. I’d put the firmness at a 5.5 out of 10, slightly softer than average. You can see that the mattress is memory foam like, so a little slow to respond (not a bad thing, just something to note for your preferences). Endy is manufactured in Toronto, Canada and starts with a visually appealing hypoallergenic stretch-knit cover (kind of feels like an optical illusion)! I like that Endy clearly discloses their foam densities and is very transparent about their materials. As you can see, the object is barely disturbed as I really push on the foam nearby, one of the best performances of motion transfer of all the mattresses I have reviewed. Endy is most often compared to Casper since they are both popular bed-in-a-box options available in Canada. I think both mattresses are of great quality at a similar price point, and I enjoyed sleeping on both. I would make the decision based on two factors, foam type and firmness. 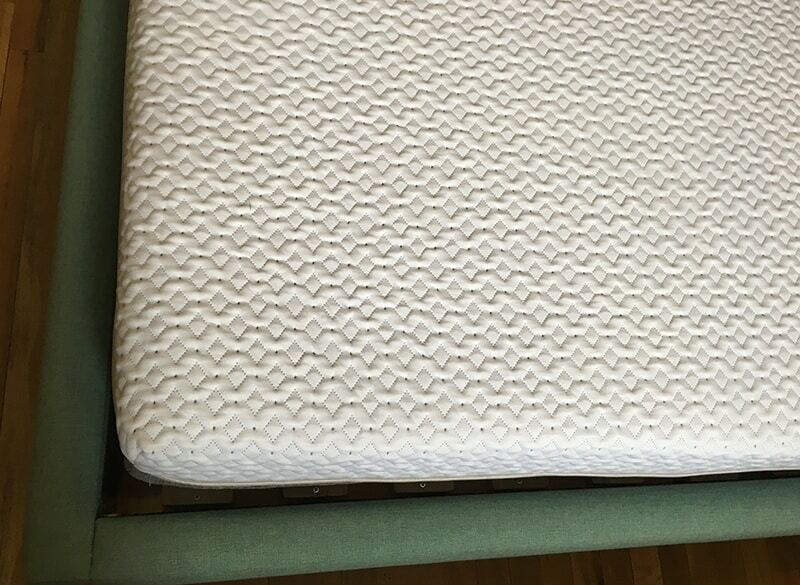 Foam type – Endy’s top layer is memory foam-like, and Casper’s top layer is latex-like foam. As a result, Casper has a little more “spring” to the mattress, while Endy has a more traditional memory foam feel. Firmness – I found both mattresses to be on the softer side, but Endy is still slightly softer than Casper. 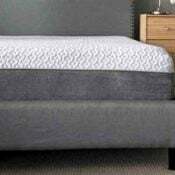 Endy is a memory foam mattress that is made and shipped out of Canada. Overall I really liked the mattress, and note that it is a little softer than average. I think it is a great option for side sleepers especially. They also offer a pillow that I am anxious to try! I really enjoyed sleeping on the Endy mattress, for a side sleeper like myself I think it’s a great option (though it may be too soft for stomach sleepers). I like the transparency and brand, and think at the price point it offers a very good value. I purchased an Endy mattress in July 2018. The mattress cover is only stretchy on the top, the sides and bottom are different non-stretchy heavier fabric. The zipper is sewn into the non-stretchy fabric, so the zipper compresses the mattress corners. The so-called top layer which is Endy foam is already coming unglued from the layer below. The mattress has become so hard it’s uncomfortable to sleep on. Endy claims all layers are Certipur-US. I checked the list of foam producers on the Certipur-US Website and Endy is not on the list. Perhaps the other 2 layers are Certipur-US certified by one of the 2 Canadian suppliers on the list. The customer service is very poor. I have put in a claim on the so-called 10 year warranty and the person who answers the emails is giving me the run-around. I would never recommend Endy either for mattress quality or for customer service. Choose another brand. By the way Endy is now a subsidiary of Sleep Country Canada as of November 2018. Check Out Lunazen Sleep, amazing mattress!! I have Endy since 2 years. IT not firm anymore and It really hot for summer. Try something else. i was wondering if there is a futon version of this mattress? something that can be used both as couch and a bed. I am wondering about your price comparison between Endy and Casper. I was just on their websites and for king size Endy is $950 (plus $50 off) while Casper was $2,900. Did I miss something? Huge price difference and what is the difference in value for a full $2,000? Thanks. Not sure where you are getting the $2,900 price from. Are you looking at the Wave instead of the Original?